When the My Kitchen, My World group announced Canada as the August destination, the first thing I thought of was maple. But I don’t like maple all that much, so the next thing I thought of was Nanaimo Bars. You see, I’ve been to Nanaimo twice, but I’ve never had a Nanaimo Bar. When I was making them, I thought they would be too sweet. They are really sweet, but also really, really good. My husband and I both enjoyed them. I think the large amount of butter helps deflect some of the sweetness. Yes, these are rich, but so tasty. The bottom layer is fantastic. Perhaps it’s especially fantastic because it contains crushed homemade graham crackers. I’m sure there are many variations of the recipe, but I decided to use this one, on the City of Nanaimo website. I cut the recipe in half and made it in a 6″ round pan (that’s why my bar is a wedge). For the vanilla custard powder, I used instant vanilla pudding mix. I used chocolate chips for the top layer of chocolate had a heck of a lot of trouble getting them to melt nicely. I know that non-chocolate-chip-chocolate melts better, but I thought I could get away with it. Apparently not. These need to come out of the refrigerator for a while before cutting. That, combined with my chocolate melting difficulty, made me think that it wouldn’t be a bad idea to sprinkle a layer of mini-chocolate chips on top rather than bothering with the melting and spreading. I may try that next time. Nanaimo is a city on the eastern side of Vancouver Island. I have lots of photos of the beautiful scenery on Vancouver Island, but the only photo of Nanaimo that I could find was this one. At least I’m 99% sure that photo is from Nanaimo. It’s definitely from Canada! The roundup of everyone’s posts will be posted on My Kitchen My World soon. Nice tribute to my homeland… explaining Nanaimo bars to my Boston colleagues was challenging. If you ever need another Canadian recipe I recommend poutine! P.S. How is it that you’ve been to Nanaimo twice? We passed through Nanaimo twice on the way to Tofino – it’s SO beautiful there! I hope to be back. I remember seeing poutine on menus and still don’t quite know what it is! Tofino really is gorgeous – I’m surprised/impressed that you’ve been up there since I find most Americans don’t have any idea it exists. Poutine is a French-Canadian (Quebecois) creation consisting of french fries, cheese curds, and gravy. The warm french fries and hot gravy melts the cheese curds into a deliciously gooey mess. It’s not the most attractive thing to eat – we had Canadian friends over who made it, and our American friends looked at the brown blob on the platter and went “ew!”. They changed their mind when they tasted it – it’s best after a day of skiing or a night of drinking. It can be easily made at home using oven fries but to be authentic, it requires cheddar cheese curds, no other substitutes will do! Your Nanaimo bar looks delicious! We made these for Daring Bakers not so long ago. LOL at the car park sign – hilarious! These look delicious! I’ve never had one of those bars-now I will have to try making them! You have a knack for finding the funniest signs on your travels!!! I love that you share the humor! Those bars look really yummy! I would not have known what to make for a Canadian-themed dish. Love the picture, too funny! Your Nanaimo bars look very delicious and just perfect. Vancouver Island is one of the prettiest places I’ve been to. What a great idea to make these in a round cake pan! 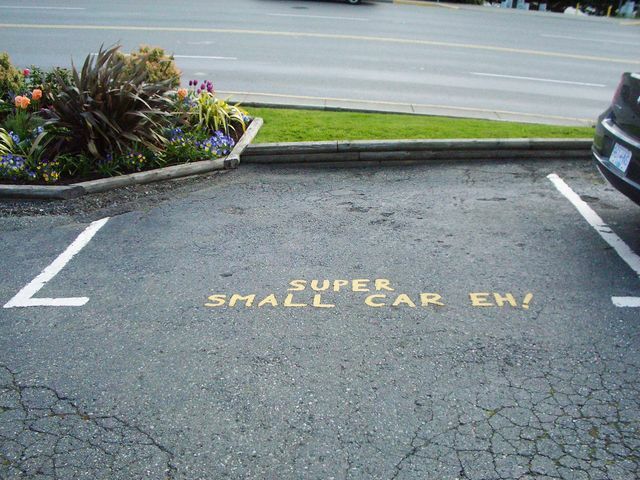 I love the photo of the parking space. I still need to make (and post) my entry. Ack! Glad to hear you thought of Nanaimo Bars! Next time you are on the island and in Nanaimo, you’ll have to try the Nanaimo Bar Martini and Nanaimo Bar Cupcake! Thanks for sharing. Well, I should have read the posts in the right order b/c I just commented on the TWD post asking if you were making MKMW this month. Duh. These look great, something the guys would love. I was actually going to make these as well b/c they were on all the sites for Canadian cooking but I could not find custard powder so I just gave up the idea. Thanks for the tip on the instant pudding! That’s why I come here…you always have the best tips! They look wonderful! I will try them now with the pudding ingredient. 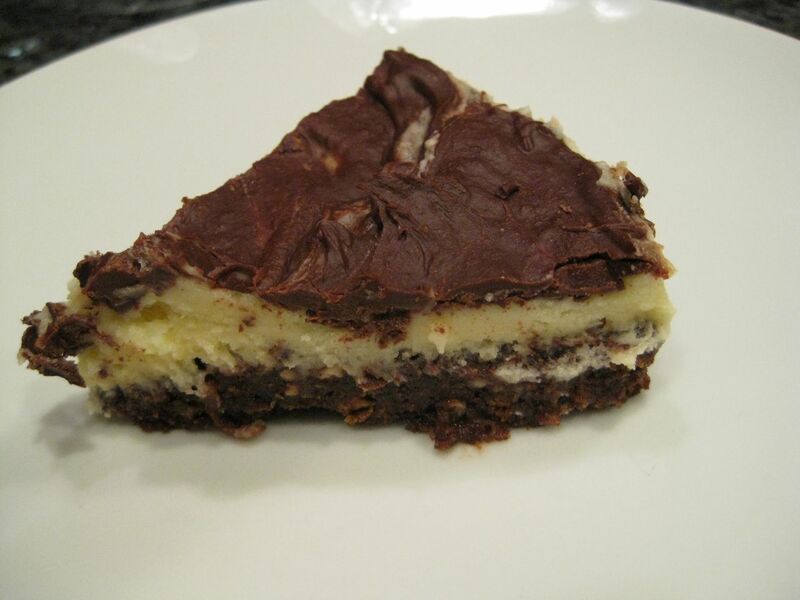 I came THIS CLOSE to makeing Nanaimo bars but figured lots of others would do the same. I will have to make these because they looked great the last time I saw them on line. My post if finally up. This was a fun challenge. I really wanted to make the poutine, but I just wasn’t sure what it would be like so I did some pork chops instead! Your bars look great. I now wish I had made those!